Having trouble with your artwork? 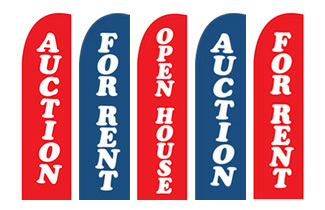 Feel free to download any of the below artwork flag banner designs free of charge and submit them to our Print Dept with the purchase of your FLBB24 or FLBB31 beach banner flag series for printing. 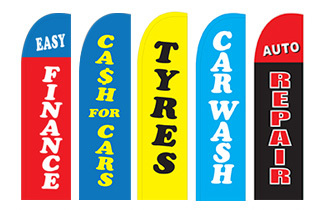 We have 100's of beach banner designs to choose from. To save the artwork & feather banners design templates simply right click and select "Save Target As" and send your chosen design to artwork@slimlinewarehouse.com.au with your order number noted. Alternatively, you can upload your chosen design using our free upload service!. 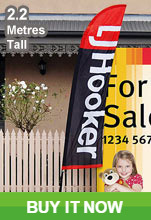 Thinking of buying a new teardrop banner but having trouble coming up with a flag banner design ? 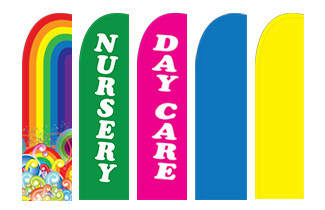 These banner flag design templates will help to alleviate all of your worries, as our graphic design team have come up with heaps of designs that work with 2.4m & 3.1m tall flags. Using a properly designed banner, it is easier to draw the attention of passersby, alerting them of your business and informing them if there are ongoing sales or upcoming events that they may attend. 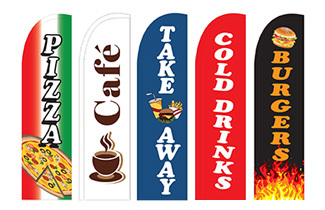 Each flag banner design uses full colour, vivid graphics that look great and ensure a professional look to show your customers you are a serious business! The different feather banners design templates we offer are in a range of industries to benefit nearly all of our customers. 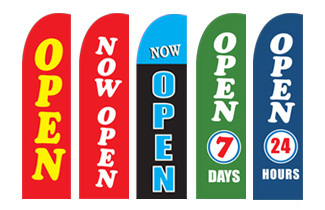 Check out the many styles we offer for automotive and car dealerships, generic sale flags for retail stores, real estate and property announcing banners, designs for restaurants, cafes, and bars, as well as a wide range of "OPEN" feather flags with miscellaneous designs offered that may be perfect for your need! 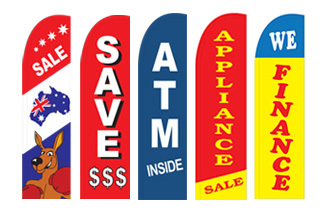 The flag banner design is an easy to use display that alerts potential customers with ease. 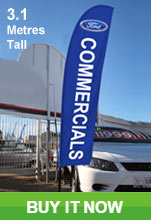 There are two sizes of banner flags to choose from, 2.4m & 3.1m to let use the right one for your needs. Each display is included with a collapsible pole to make it easy to store when not in use or for transport when brought to and from different events. There are two ways of placing the flags on the ground. A screw-in sign stake is included to be put into the ground when used at outdoor events to securely display your teardrop flags and keep them anchored. This is extremely helpful when used at outdoor festivals or school fairs, since it is harder for the feather banners to be knocked over. When used indoors, obviously staking the flags into the ground isn't an option, so there is a cross base included for these applications. A water bag is provided that helps to weigh down the base and keep it in place. The cross base isn't only used for indoor events like exhibitions and trade shows however. Many of our customers have utilized these displays on the pavement outside of their business to great affect. Restaurants, bars, and cafes have alerted patrons of there location and drawn them in, whilst car dealerships and retail stores use this same method to promote their sales and great deals. The feather banners use woven polyester fabric that is long-lasting to be able to withstand the elements when used outside without worry. Your designs are digitally printed using a dye-sublimation process that offers a vivid representation of our designs onto the material. This style of printing bleeds through to the other side of the fabric as well, offering a dual-sided display, though the backside of the flags will be a reverse image. The simple designs that are used however means they are still easy to read, so when the teardrop banners are blowing in the wind passersby will still be able to read the words no matter which side is shown! Setting up the outdoor stands is easy, with the telescoping pole fitting into the slot made from folded over fabric easily. Once the flag has the pole within, you can place it onto the base, whether it is onto the cross base of ground screw. If using the water bag to weight down the cross base, that needs to be placed onto the base prior to inserting the flag onto the pole. There is a carrying bag provided with your flag kit purchase as well (not with the design templates offered on this page) that make transporting the unit to and from events fast and easy, since each component fits into the bag. The bag also helps to keep the flag looking fresh and components free of gathering grime or dust if storing them in between uses! There are heaps of different items for you to pick from in the online catalogue, making it easy for you to outfit your business in style. We offer a wide selection of products because we know our customers are diverse, and using the proper style display at your business can be the difference between making a good impression and losing a customer. We have thoroughly inspected each available product prior to being offered for sale to ensure long lasting use. Our quality assurance team puts each product through tests before offering them to customers so that only the best quality displays make their way into the hands of our customers. We are consistently adding new products to choose from, keeping our customers aware of the latest in technologies, styles, and trends in order to keep your business ahead of the competition. Slimline Warehouse has been a leading provider of quality goods for over 20 years, specializing in POP, POS, exhibition, and retail products. There are heaps of styles to choose from that even include custom designed graphics like the ones on this page. We proudly provide despatch to anywhere in Australia, including Melbourne, Canberra, Adelaide, Wollongong, Gold Coast, Perth, Townsville, Cairns, Sydney, Alice Springs, Hobart, Newcastle, Darwin, and Brisbane!